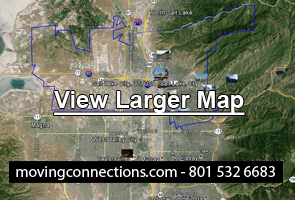 Moving Connections is your local professional moving company serving the Wasatch Front. Although the majority of our business focuses on residential moves, we also have a lot of experience in business moves, including everything from office moves within the same building to intercity major corporate relocations. Moving Connections also offers budget-minded customer pack moves for families and individuals looking to stretch their dollars. The reason that Moving Connections can offer such a broad range of services is that we hire only experienced professional movers. And Moving Connections is federally licensed, bonded, and insured. So we bring a level of service that is unexcelled along the Wasatch Front. In addition, Moving Connections carries a broad range of moving supplies, from hundreds of different sized boxes and special purpose boxes, to packaging tape, stretch wrap, bubble wrap, loose fill, cargo straps, and dozens of other products for those with a “do-it-yourself” frame of mind. If Moving Connections is moving you to Sugarhouse it's a perfect time to begin to utilize the many resources and bounties of Sugarhouse. For example click on the picture to the left to go the Moving Connections 'Support - Advice - Assistance' page and discover Sugarhouse for the first time. Once you are on the 'Support - Advice - Assistance' page go ahead and open the .pdf link found there and tape the list of emergency and useful phone numbers on your refrigerator. Moving Connections has gone to great pains to find those links and connections to integrate you quickly into Sugarhouse life. The stress of moving is rivaled by little else in life. One can feel emotionally uprooted while at the same time being assailed by countless practical items, all of them demanding one’s attention “right now”. Allow Moving Connections to take the burden off your shoulders and relax with our Sugarhouse full service residential move, our most popular service. With a full service move, two men will show up at your residence in a clean Moving Connections truck loaded with stretch wrap, professional grade moving blankets, dollies, piano boards, loads of boxes and tape, plus whatever else is necessary for your Sugarhouse move. They will then stretch wrap and blanket your furniture and larger items and load them onto the moving truck, securing them with cargo straps to the rails of the interior wall of the truck. This keeps them from shifting and damaging themselves or other items in the cargo bay of the vehicle. After that, the Moving Connections moving crew will pack the smaller household items such as dishes, books, lamps, and other smaller items. They will then load these items onto the truck according to industry standards to insure that they arrive at their destination safely. Though putting your valued belongings in the care of someone else might seem a bit daunting to you, you can be at ease when you hire Moving Connections. First, we hire only professional movers with experience in the moving business. In addition, our moving crews are drug tested for your safety. And for your insurance safety, Moving Connections is federally licensed, bonded, and insured, with a Motor Carrier Number (MCN). So if you’re planning a Sugarhouse residential relocation, please make a call to Moving Connections to speak with one of our customer assistants. They will answer any questions you might have about our service, plus they can give you a quick moving price quote for your Sugarhouse move. And if you’re planning a Sugarhouse corporate move, Moving Connections is experienced with these, too. Whether you’re just moving your office down the hall or you need a complete corporate relocation to another city, Moving Connections has the experience and professional moving crews to make your move quick and worry-free. Sometimes people like to do things themselves in an effort to save money or just to see that things are done their way. We here at Moving Connections strive to be flexible in offering various types of service to fit the needs of our customers. That’s why we have a labor only move option, sometimes called the "labor only moving help" service. With a “labor only” move, you can pack most of your items yourself, plus you rent a truck and drive it yourself to your new destination. The Moving Connections professional moving crew simply wraps the furniture and other large items and loads them on the truck for you. They also load the items that you pack. This can reduce labor time considerably for your Sugarhouse move, and so it reduces your bill proportionately. But you should know how to pack things so they won’t be damaged during transit in the cargo compartment of a moving truck. Moving Connections is a business, and as such, it understands business considerations for budgets and time. We also understand that businesses expect a certain level of professionalism from other businesses. That’s why we at Moving Connections offer a corporate relocation package that doesn’t gouge you or add on hidden surcharges and spurious taxes at the end of the move. And we’re legitimate: we’re federally licensed, bonded, and insured, and all of our moving crews are experienced professionals who have been drug tested and background checked for your safety and security. And Moving Connections has been in the moving and shipping business for more than thirty years.